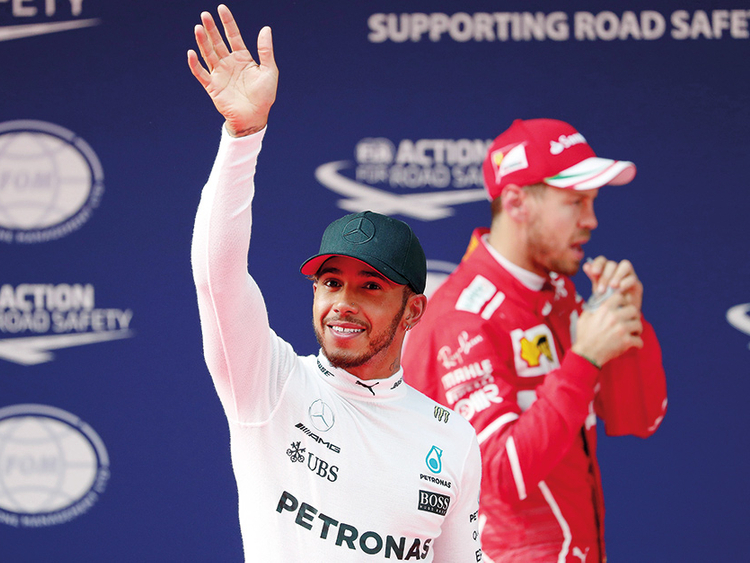 Shanghai: Lewis Hamilton roared to pole position in Saturday’s qualifying for the Chinese Grand Prix as Mercedes look to avenge a stunning defeat by Ferrari in the Formula One season opener. The Briton, stung by Sebastian Vettel in Melbourne two weeks ago, pipped his German rival by two tenths of a second in Shanghai with Mercedes teammate Valtteri Bottas and Ferrari’s Kimi Raikkonen filling row two for Sunday’s race. Hamilton jumped onto the pit wall to soak in the adulation of the crowd after clocking the fastest lap of one minute, 31.678 seconds to capture his fourth Chinese pole in five years. “We knew it was going to be close,” said Hamilton, forced to play second fiddle to Vettel in the third practice session earlier in the day. “I managed to just chip away at it from session to session. It’s exciting for me because we really fight with these guys,” added Hamilton, a four-time winner in Shanghai. Vettel, meanwhile, was left shaking his head in disbelief. “I don’t believe that, it was the perfect lap,” said the four-time world champion, who looked unstoppable in Saturday’s practice run. The signs point to another furious battle between Mercedes and Ferrari but with rain forecast for race day, Red Bull’s Daniel Ricciardo could fancy his chances after qualifying fifth. Teammate Max Verstappen gets an unwanted opportunity to test the theory that overtaking has become harder in the new wider Formula One cars after only qualifying in 19th. Ricciardo will start alongside Felipe Massa on the third row after the Brazilian clocked the sixth fastest time for Williams. Behind them, Renault’s Nico Hulkenberg edged out Sergio Perez’s Force India for seventh with Daniil Kvyat’s Toro Rosso and Lance Stroll’s Williams rounding out the top 10 places on the grid. There was a hairy moment at the end of the first session of qualifying when Antonio Giovinazzi smashed his Sauber into a wall on the pit straight, although the Italian walked away unhurt. Meanwhile, Mercedes chairman Nikki Lauda bet against his team grabbing the pole position on Saturday for the Chinese Grand Prix, but it was a 10-euro wager he was happy to lose. Speaking to reporters, team boss Toto Wolff pulled out a 10-euro note that he won from the Austrian racing legend Lauda — now a Mercedes part-owner and non-executive chairman — after their star driver Lewis Hamilton seized the pole in Shanghai. “I think he was happy about losing the bet. But generally Nikki Lauda is not happy about losing money overall,” Wolff said, prompting laughs. Mercedes, the defending constructors’ champions, hope on Sunday to avenge the surprise defeat handed to Hamilton by Sebastian Vettel and Ferrari in the Formula One season opener in Melbourne. “But Lewis, thank God, pulled out one of his special laps,” he was quoted saying. Hamilton, the British triple world champion, pipped his German rival Vettel by two-tenths of a second in Shanghai qualifying, with Mercedes teammate Valtteri Bottas and Ferrari’s Kimi Raikkonen filling row two for Sunday’s race.